II. The Heyl Ha Avir was the first Air Force who used the F-16D double seater mostly not as training aircraft, but as strike plane. The israeli Name of this bird is Brakeet what means Thunder. Finally i took Wilcos F-16 skin, modded it a little bit. 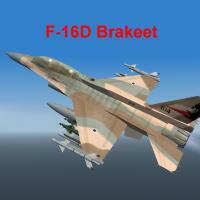 All this parts i put together to have a israeli F-16D Brakeet. V. THIS MOD IS FREEWARE. COMMERCIAL USE IS NOT ALLOWED!